Unitarian Universalism evolved from two strands of liberal Christianity. Unitarians emphasized the oneness of God and the teachings of Jesus, with less emphasis on his divinity and the meaning of his life and death. This movement was prominent in the first three centuries after Jesus’ death, but became heresy after the official adoption of the Trinitarian (God in three persons) position by the council of Nicea in 325 CE and thereafter. Unitarian theology surfaced throughout western history, most strongly in New England Congregational churches in the late eighteenth and early nineteenth centuries. Many of the founders of this nation (Thomas Jefferson, John and Abigail Adams, and others) were Unitarians. Unitarians have been prominent in politics, social justice, the arts and sciences in the United States since that time (Ralph Waldo Emerson, Henry David Thoreau, Clara Barton, Dorthea Dix, Adlai Stevenson, Linus Pauling, ee cummings, Theodor Geisel [Dr. Suess] and many others). Universalism is the belief that the salvation offered by the life and death of Jesus is universal (universal reconciliation), available to believers and non-believers alike. This movement reached its peak in America in the late nineteenth century, and was the sixth largest denomination in the United States at the turn of the 20th century. Both movements attracted skeptical persons of various beliefs who had failed to find supportive environments within creedal religions. The two organizations merged to form the Unitarian Universalist Association in 1961. Unitarian Universalist Congregation of Tuscaloosa History: Founded in 1954 as part of the fellowship movement in the Unitarian faith, the congregation was immediately in the midst of the civil rights movement. “Two African American women were admitted to the University of Alabama. They were not allowed to live on campus but invited to attend classes. [Only] Autherine Lucy began classes. … The brief history of the congregation that is found in the Ministerial Search packet states that the new fellowship’s president, George W. DeSchweintz, invited Ms. Lucy ‘to attend services as a show of support in the face of racial prejudice.’ She did attend according to founder Charles Wilson and the service went quietly. “The history as recorded in the Ministerial Search packet states this event made the newspapers and caused quite a stir. I was unable to find any account in the Tuscaloosa News of the Fellowship’s invitation as a factor in the riots that occurred on Campus during her first week at the University in February of 1956. [Founding member] Charlie Wilson and others report that the KKK roamed the campus in red hoods and baseball bats the next day after the service.The KKK burned crosses on the UA Dean’s yard and threatened bomb scares. At one point [her car] was surrounded. She barely managed to escape with her life.These riots led to her expulsion from the school for her own safety’s sake. There was a time period in the early 1960s that the fellowship discussed disbanding. “Membership had begun to grow again in the late mid to late 1960’s. As Charlie Wilson reported to me, having Gov. Wallace stand at the schoolhouse doors barring the way for two new African American students admitted to University of Alabama was a good way to promote Unitarian Universalism. There was heated discussion about the freedom riders coming through Tuscaloosa. Should members of the church offer them home hospitality? There was concern for the safety of members’ homes. Member Gene Byrd believes some members did offer home hospitality but does not recall who those members might have been. In the 1970s, member Betty Mego at the request of the Unitarian Universalist Service Committee began advocating for the fellowship to affiliate with the Southern Student Project. This project was a student exchange program where Black students from Tuscaloosa would go to State College, PA to attend school. This project met harsh resistance by the fellowship. She writes in a letter dated May 1970 to Antoinette Holl of State College, “There is not the slightest doubt in my mind that this (the $100) represents ‘a generous contribution and all that is really necessary’ in the minds of several members of our UUA group. Strange revelations have been surfacing.” The fellowship refused to officially affiliate. During this time, Rev. Carl Bretz arrived to work at Bryce Hospital. He served as president of the board and with his leadership strengthened the fellowship and it began to grow once again. The congregation brought on Rev. AJ Matill as its first part time minister in 1979. During his tenure, we began the annual Halloween picnic at Moundville which continues today. When Rev. Matill moved on, Rev. Bretz served as part time minister until 1989. One of his outreaches continues to this day, Meals on Wheels. Once a week members continue to deliver meals to shut ins. Rev. Bretz is now our minister emeritus. The fellowship met for the longest time in the Hillel Center on the UA campus. But they also spent time meeting at the Masonic Lodge and the YMCA before purchasing the current property and building the church in 1992. There was a series of part time ministers Revs. Michael Seider, Joan Armstrong, Barbara Jamestone, Chris Brownlee, Jeff Jones, and Jennifer Innis. Rev. Innis served as the congregation’s first full time interim minister. Then in 2001, after her interim,the congregation called the Rev. Michael Thompson as its first full time settled minister. In 2005, the congregation sought to build a sanctuary but UUA consultants advised that it was not financially capable to do so. Disappointed, the congregation lost members and in 2007; Rev. Thompson resigned. In 2008, Rev. Fred L Hammond came on as a consulting minister on a part time basis. The congregation began to grow again. In April of 2011 an E-4 tornado ripped through Tuscaloosa. Seven families lost their homes in the tornado. The UU Trauma Response Ministry team came to assist the congregation in recovery. Congregations across the nation sent cards and financial support to assist our families. Also that year, Rev. Hammond was arrested at the state capitol in protest against HB 56, Alabama’s anti-immigrant law. 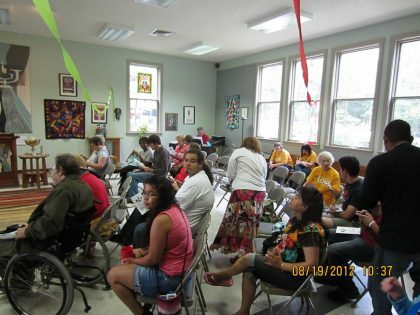 In 2012, the congregation provided home hospitality to the Undocubus. In 2013, the congregation called Rev. Hammond as its full time settled minister. In 2014, Rev. 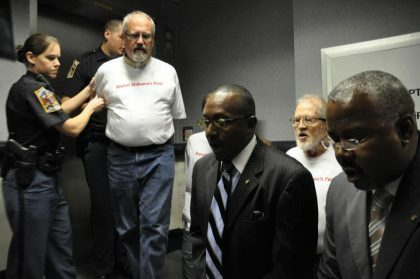 Hammond was arrested for civil disobedience demanding Medicaid Expansion in Alabama. In 2015, we welcomed Monica Dobbins as our Ministerial Intern. Over the past 8 years, the congregation has enjoyed steady growth both numerically and in depth. 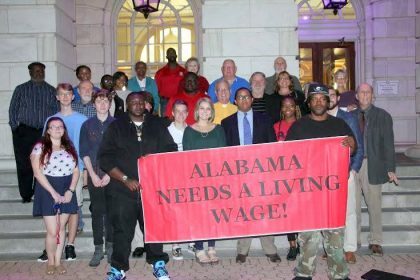 It continued its social justice focus founding Move to Amend–Tuscaloosa, founding Druid City Pride, and a founding member of Tuscaloosa Economic Justice Coalition. The Board has strengthened the congregation’s organizational structure and health through the Leadership Development and Finance teams. Today, our congregation has come full circle with civil rights with the Black Lives Matter movement. While Tuscaloosa does not currently have a Black Lives Matter group, the congregation is studying the movement to unravel its own white supremacy and white privilege. It is a congregation that is becoming woke and staying woke in the struggle for black liberation.